Namine went back to tennis practice (not that there was any question of that happening) and loved it more than ever. These first two weeks, tennis practice was only an hour long. Many parents commented — it wasn’t just me — that that hour really seemed to have flown by. The coach is hoping to extend the practice time by a half hour, maybe even an hour. We’ll just have to play it by ear. Since the first practice had focused on strokes — backhand, forehand, that sort of thing — this week they introduced movement. Of course Namine knows how to wheel, but her inclination, when she’s carrying anything, is to place it in her lap. In wheelchair tennis, however, it’s important to keep the racket on-hand — literally — so she had to get used to holding it while pushing herself. Since there was only an hour for practice, the coaches spent some time reviewing what was learned last week. Namine, for her part, seemed to have lost nothing in the time between. After practice was over, we weren’t in any rush to leave. 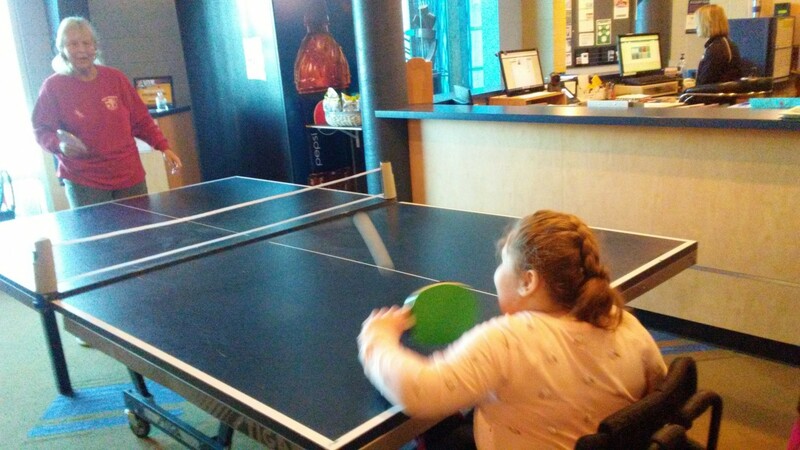 Namine wanted to play table tennis, she swatted the ball back and forth with one of her coaches, Jessica, and me.